Suzanne of Cricut Crafting Grammy. We are back on Thursdays to explore different themes, elements, techniques or embellishments. This week we are using a Cross on our tags and ATC's. There is no restriction on what tools are used to create these tags or ATC's. It could be a die cut machine, punches, stamps, etc. The sky is the limit. However if the Design Team uses Digis or SVG's they will be from Paper Crafting World. As a side note, if you don't know what an ATC card is, we have a definition at the bottom of our post. there will be no charge during this week's Totally Tags n' ATC's post. We hope you were inspired to start doing some Tags and ATC'S!!!! 1 Random Winner and 3 DT Pick Winners!!! This link up will typically be open for the entire month. Because this is the last week in February, we will add this week to March and will end this link up on March 31st. 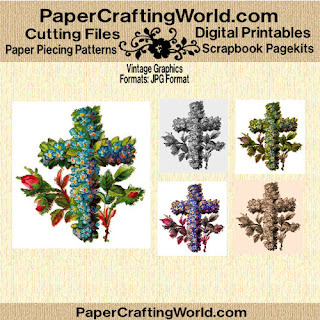 At the end of the month we will pick 1 random winner to receive 3 digi's or cutting files of their choice from PaperCraftingWorld.com and the designers will pick 3 of their favorites to win 3 digi's or cutting files as well... so let's get started!!!! Here is an interesting definition from Wikipedia on ATC's. Be sure to come back tomorrow for another Digi Desserts Fridaze Link Up and another FREE Digi! The tags this week are so pretty :) Great job Ladies!! Thank you for these beautiful Easter graphics!! !